This brings us to the energy flows of the body. The best way to use crystals is in conjunction with your own energy ‘points’. These are known as chakras. The word Chakra is Sanskrit for ‘wheel’ because each of the seven main chakras is an energy point that spins to carry and transfer energy. If the flow of energies is blocked because of negative emotional issues such as stress, anxiety or anger they can cause physical illness. Each chakra has a colour associated with it. To clean, open and activate these energy points you can wear a chakra necklace or bracelet which includes crystals in each of the seven chakra colors. Alternatively, you can perform a ‘chakra layout’. You will need 7 crystals that correspond to the chakra colors. You can buy complete ‘chakra sets’ or choose individual crystals. There is a list below to help you choose. You may feel more drawn to one than another and if so, go with that one. You will be laying down on the floor for this exercise. First, make sure that you will not be disturbed so take the phone off the hook! Gather your seven crystals and lay them on the floor in sequence next to where you will lie. Then lay down and place each stone on its’ associated chakra point on your body. Simply lie quietly and try to relax. Do this for at least several minutes. Function: Helps to connect you to your spiritual inner self. Helps with positive thoughts, brings inspiration and increases imagination. Symptoms of chakra blockage: feeling confused, can’t think clearly, depression, becoming obsessional, feeling tired all the time. Crystals to choose from: Amethyst, ametrine, atlantasite, lepidolite, opalite, clear quartz, ruby in zoisite, russian serpentine, seraphinite. Function: Helps with clear vision (physical and spiritual), strengthens intuition, aids psychic abilities, helps with concentration, brings increased self-knowledge. Crystals to choose from: Amethyst, celestite, fluorite, lapis lazuli, lepidolite, moonstone, clear quartz, seraphinite, sodalite, turquoise. Function: Helps with clear communication and expressing ourselves. Symptoms of chakra blockage: repeated colds and sore throats, asthma, hearing issues including tinnitus, stiff neck, being unable to show emotion. Crystals to choose from: Amazonite, angelite, aqua aura quartz, aquamarine, blue chalcedony, blue lace agate, blue calcite, celestite, chrysocolla, kyanite, labradorite, lapis lazuli, lepidolite, clear quartz, sodalite, tanzanite, topaz, turquoise. Location: Middle of the chest..
Function: The center of emotion, helps with being compassionate, showing and feeling love, understanding and forgiveness. Symptoms of chakra blockage: heart problems, lung problems, hyperventilating, circulatory issues, raised blood pressure, fears of abandonment or betrayal. Location: Between belly button and bottom of ribs. Function: Helps with confidence, having a sense of humor, personal power and authority, showing and feeling warmth. Symptoms of chakra blockage: anxiety, stomach ulcers, digestive issues, feeling low, constant tiredness, allergies, feeling overly sensitive, having low self esteem, feeling a loss of control in one’s life. Crystals to choose from: Ametrine, orange calcite, citrine, haematite, yellow jasper, moonstone, clear quartz, rose quartz, rhodonite, sunstone, tigers eye. Symptoms of chakra blockage: impotence, bladder, kidney and uterine disorders, prostate problems, lower back pain and infertility. Associated emotionally with fear, shock and guilt. Location: The base of the spine. Function: Helps with keeping your feet on the ground, controls the nervous system so helps with keeping you safe and centred, promotes stability and patience, courage and success. 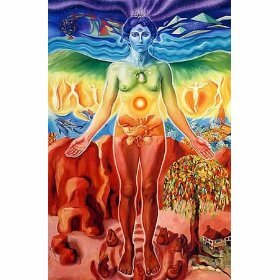 Symptoms of chakra blockage: problems with any part of the body from the hips down, arthritis issues, dental problems, constipation and often issues with gaining weight or obesity. Crystals to choose from: Garnet, haematite, red jasper, black obsidian, smoky quartz, clear quartz, rhodonite, black tourmaline. It’s also advisable to put a ‘grounding’ crystal such as black tourmaline, haematite or smoky quartz on the floor between your feet to keep you ‘anchored’ and stop you feeling spaced out. If this sounds like too much hassle and you’re not sure about the whole crystal thing anyway – why not just get yourself a bracelet, necklace or earrings of clear quartz. You may have noticed that this crystal is applicable to every chakra and it is a favorite with crystal lovers because of its’ multiple applications. If you’re not a jewelry wearer, just put one under your pillow and see how it improves your sleep. If you find it on the floor one morning – it has done its’ job! Don’t knock it ’til you’ve tried it! yes – looking inward for healing via our 7 chakras is definitely the way to go. i’d even add some healing exercises. two good exercises for the root chakra are: stomping ones feet (barefoot) and the “bridge” yoga pose. Thanks. Thanks for putting up this. It is always great to see someone educate the world.